One of my favourite things growing up was when the Wam would make cheese puffs. Something relatively simple to make but absolutely moreish. I could eat the entire tray of puffs myself in about 3 minutes flat. They are light and fluffy and have the perfect burst of cheese in each bite. Totally addictive and probably my earliest memory of comfort food. 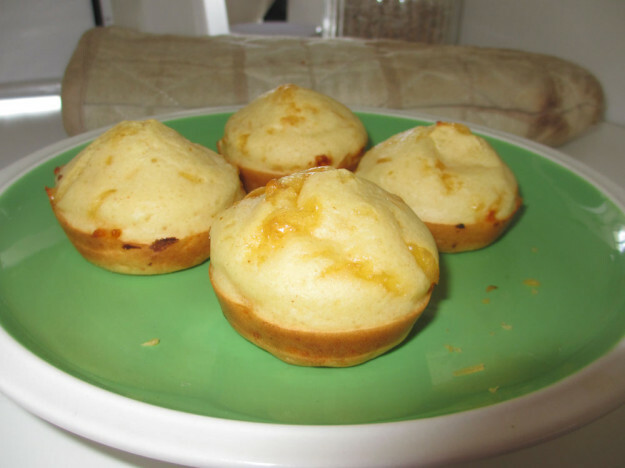 Easy peasy lemon squeezy – it is a recipe that the Wam got from a lady in Swakopmund in 1980. So it is tried and tested and well worth the minimal effort. Bang that all in a bowl, give it a mix and spoon into the muffin tin. Stick that in the oven which has been preheated to approx 200 degrees C and bake for 10-12 minutes. And eat! I like to have one as soon as it comes out the oven, piping hot and leaves me wanting more! This entry was posted in Eat and tagged baking, cheese, quick and easy. Well, YOUR mom taught you well – those are way better than any I make! Yum! And the cool thing is you can leave out the egg if you don’t have one. almost on my way! Just 6 sleeps til we leave!